Portable mixers play a very significant role in many industrial applications, and if properly selected and configured can provide the user with many years of reliable, trouble-free service for a wide variety of blending and mixing operations. Neptune™ offers an array of mixer styles to meet the needs of unique blending and mixing activities. 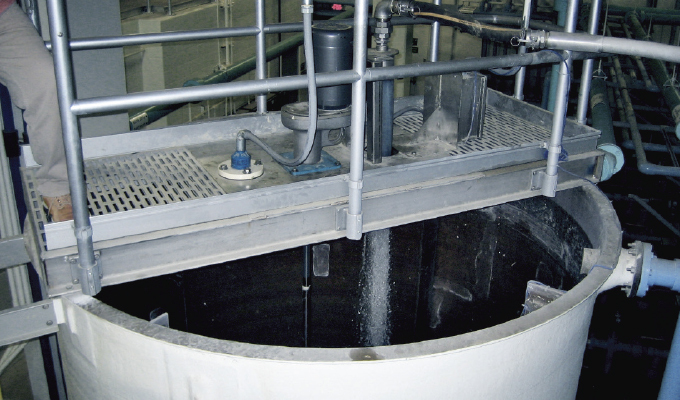 Pumps may grab the headlines in industrial applications, but mixers are the leading technology for many critical mixing and blending tasks, provided they are configured and utilized properly. Pumps are the acknowledged workhorses in industrial fluid-handling applications, capable of reliably, safely and consistently transferring thousands of gallons of varying commodities at a rate that helps plant operators satisfy the strict demands of challenging production schedules. 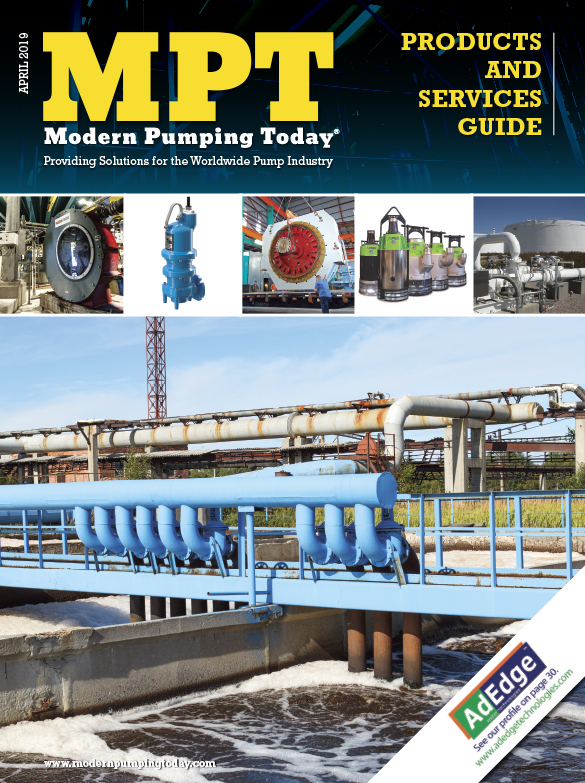 However, there is another technology that, while not necessarily as highly regarded as the pump, plays a significant role in critical production and fluid-handling processes in industrial operations. This technology is known as the portable mixer, and properly designed and engineered mixers can provide the operator with many years of trouble-free service in a wide variety of blending or mixing operations. Indeed, while the pump’s main job is to facilitate the movement of fluids from Point A to Point B in the most efficient manner, mixers are more of a jack-of- all-trades that possess the ability to perform a number of important tasks, including blend fluids of varying viscosities, suspend or dissolve solids, disperse immiscible liquids (think water and oil), and disperse small amounts of gases in liquids. 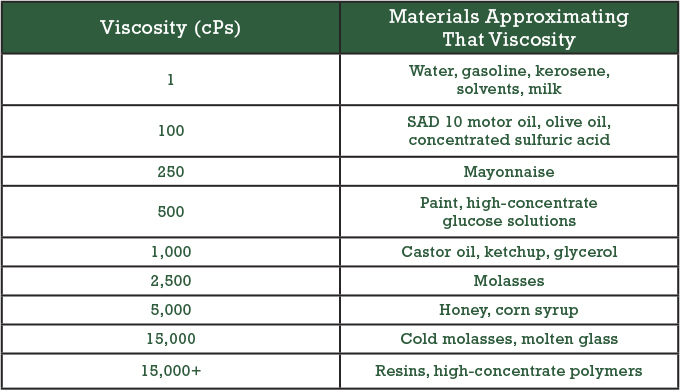 This makes them ideal for use in a variety of different applications—from water and wastewater treatment to batch chemical preparation—and with a number of commodities with viscosities ranging from 1 to more than 25,000 centipoise (cPs), including paints, varnishes, polymers, textile dyes, pharmaceuticals, food products, and soaps. But like any other piece of industrial equipment, portable mixers only operate at their highest level of efficiency, effectiveness, and reliability if they are properly configured for the specific mixing or blending task. With that in mind, there are a number of operational variables that must be taken into consideration when choosing and implementing a mixer. This article will identify the variables that should be considered before choosing the mixer technology that will result in an optimized mixing or blending operation. Portable mixers can be separated into many categories with the main ones outlined below. When mixing in larger tanks, the mixer should be positioned vertically and on-center. In this configuration, the attachment of baffles to the tank walls is recommended in order to prevent the tank’s contents from rotating and creating the vortexing that will hamper proper top-to-bottom turnover. The most common are lab and pail, drum and tote, and light- and heavy-duty mixers. 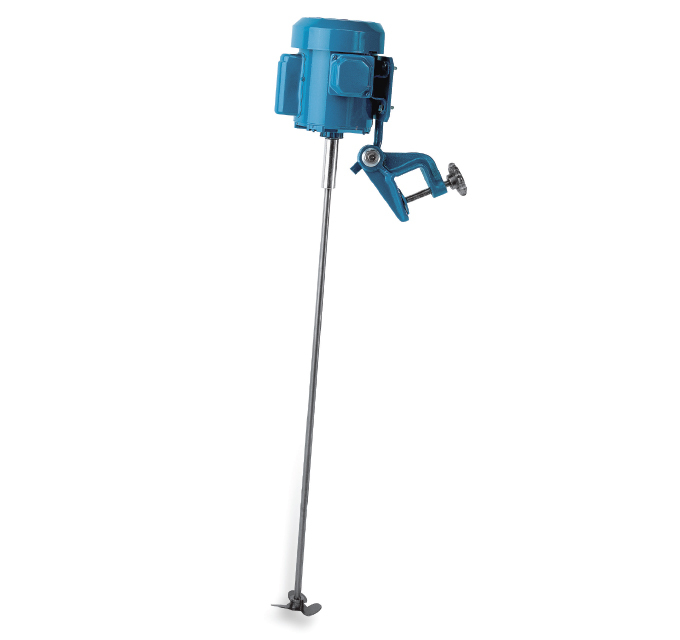 Lab and pail mixers are very small and are most often used, as their name suggests, in labs for mixing in small vessels or industrial applications where a liquid product is provided in a pail. The most commonly used portable mixers in industrial operations are the drum and tote tank-mixer designs. Drum mixers are utilized with the 55-gallon drums in which many industrial chemicals are shipped. 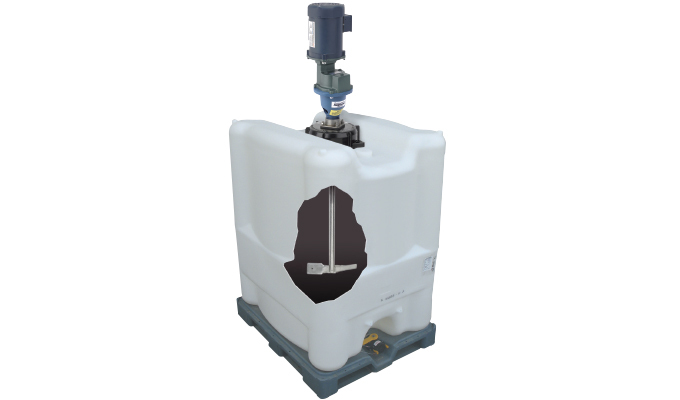 Tote (IBC containers) sizes can vary anywhere from 220 gallons to more than 500 gallons. Drums and tote tanks generally have a lid or top opening that have a bung connection or a larger opening. The mixer will require that a small fixed or folding prop be attached to the end of the mixer shaft so that it can be properly inserted into the drum or tote opening. Most models of portable mixers are either gear-driven with speeds of 350 or 420 revolutions per minute (rpm), or direct-drive, with speeds of 1,750 rpm. 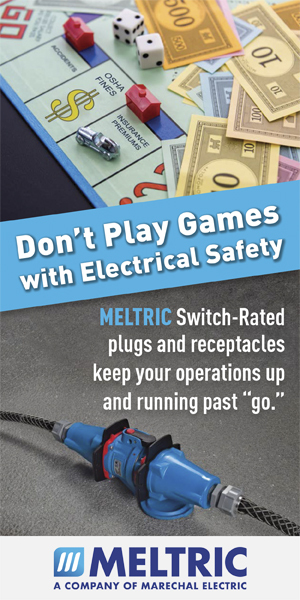 Most can be fitted with variable-speed drives or air motors that can provide variable speed, if needed. There are three main types of mounting configurations for non-drum or tote portable mixers. One is c-clamp, which normally has an adjustable angle of entry that is controlled by a ball-and-socket design. The angle riser provides a fixed 10-degree angle of entry into the mixing vessel and the flange mount to attach to the flange on the tank. Drum and tote mixers can be threaded into the bung opening in a drum or tote, c-clamped above the vessel, attached to the drum lip, or have special brackets designed to mount on the tote or bulk tank. These brackets can be unattached when the mixing process is completed. When properly designed, mixing systems will reliably provide the operator with the hoped-for finished product. 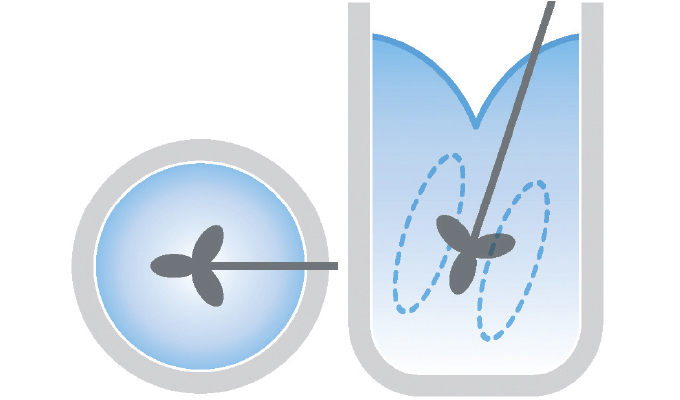 There are three common models of portable mixer propellers that can be used: Square Pitch; 1.0 pitch, or marine prop, which is one of the most effective pumping devices; and Super Pitch, which has a 1.5 pitch that allows it to deliver higher pumping rates at the same diameter as Square Pitch, though it does require more horsepower to operate. Specialty hydrofoil blades, which offer a more directed flow pattern, can also be advantageous for the user. 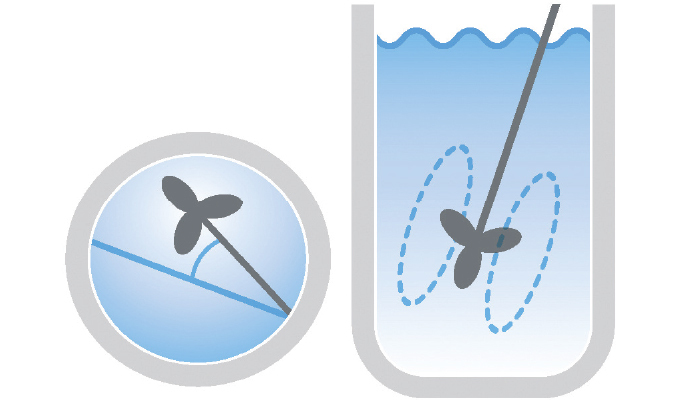 The rule of thumb for portable mixers is to position the mixer propeller one to two propeller diameters from the bottom of the tank, which will determine shaft length. It is desirable to position the prop closer to the bottom of the tank (one diameter) when mixing slurries or products with solids that have a tendency to settle out. When sizing a portable mixer it is important to know the degree of agitation required for the application. Mild agitation is normally 1/2 to 1 tank turnover per minute, medium agitation is 1-1/2 to 2 tank turns per minute, vigorous agitation is 2-1/2 to 3 turns per minute and violent mixing has tank-turnover rates of more than 3 turns per minute. The prop’s pumping rate is available from mixer manufacturers for each mixer model type and size at the various rpms at which they will operate, and is normally measured in the gallon-per-minute pumping rate of water. Sizing and selecting a mixer can be easily done with this information. For example, a 100-gallon tank of a water-like chemical requires vigorous agitation, or 2-1/2 turnovers. Knowing that a 4-inch square pitch prop at 1,750 rpm delivers a pumping rate of 250 gallons per minute, a portable mixer could be selected. Keep in mind, however, that as liquid viscosity increases the pumping rate decreases. Neptune™ offers a complete array of mixer types and styles, all of which have been designed to deliver the highest levels of performance. In most mixing applications involving small cylindrical tanks of 1,000 gallons or less, the mixer is clamped to the side of the container. Effective mixing patterns will be achieved if the mixer is angled 10 to 15 degrees away from the vertical, either off-center or on-center. Angling the mixer 15 to 20 degrees off of the tank’s centerline is preferred when good material turnover is required, as when mixing a slurry. On-center angling is better for gentler mixing and creates a vortex. 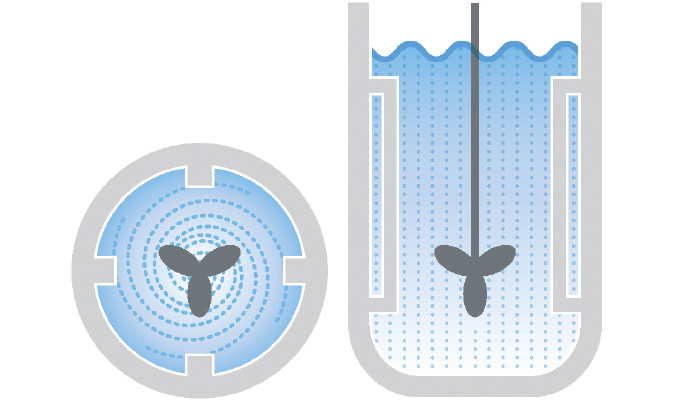 Vortexing occurs when the contents of the tank swirl around the walls of the tank without much top-to-bottom turnover; this creates a less-efficient mixing operation and the possibility of uneven mixing or blending. Cylindrical tanks with capacities of more than 1,000 gallons may require that the mixer be mounted directly in the center of the tank with the shaft in a vertical orientation. In this configuration, it is recommended that the operator put baffles on the walls of the tank in order to prevent the contents of the tank from turning in the direction of the mix, or creating an inefficient vortex. When this occurs, the mixing action in the tank will be poor. It is suggested that four baffles be used in this situation with them placed 90 degrees apart on the walls of the container and sized approximately 1/12th of the tank’s diameter. The baffle should not fully extend to the bottom of the tank and a noticeable gap, usually 1/2 to 1-inch in size, should be left between the baffles and the tank walls if solids are present or for viscosities over 500 cPs to prevent a buildup where the baffle connects to the tank wall. If baffles are required in a square or rectangular tank, they should be placed at the midpoint of each of the four walls, with the same sizing and positioning parameters for baffles that are placed in circular tanks acknowledged. 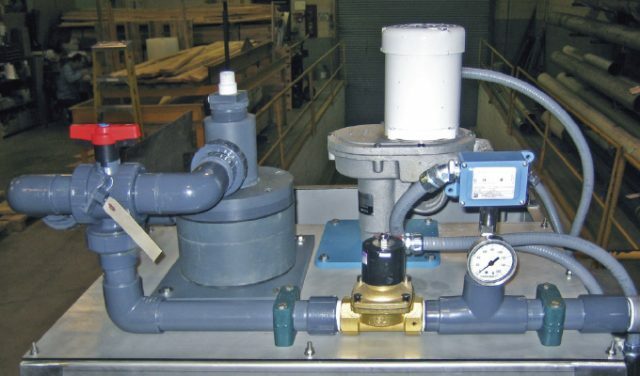 Pumps may get the glory in industrial manufacturing or fluid-handling applications, but portable mixers can play an undeniably significant role in optimizing the effectiveness of the entire production operation. As with any technology, knowing the do’s and don’ts of mixer selection and operation, as well as the handling characteristics of the fluid to be mixed or blended, will play a major role in selecting the technology that is perfectly suited for the specific operation. Tom O’Donnell is director of business development for Neptune™ Chemical Pump Company and PSG®. He can be reached at tom.odonnell@psgdover.com or 215.699.8700, ext. 3327. Based in North Wales, Pennsylvania, Neptune is a leading manufacturer of chemical metering and peristaltic pumps, chemical feed systems, chemical injection accessories, make-down systems, and portable mixers. Neptune is a product brand of PSG®, a Dover company, Oakbrook Terrace, Illinois. PSG is comprised of several of the world’s leading pump companies, including Abaque®, Almatec®, Blackmer®, Ebsray®, EnviroGear®, Finder, Griswold™, Mouvex®, Neptune™, Quattroflow™, RedScrew™, and Wilden®. For more information, visit www.neptune1.com or www.psgdover.com.